Colorado and big game hunting just naturally go together. After all, Colorado is renowned for its mountains, wilderness, and wildlife. Here are a few reasons why you should consider big game hunting in Colorado. Do you want to hunt elk? 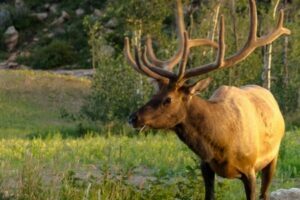 Colorado boasts the largest elk population of any state. Our elk population is estimated to number more than 250,000 making Colorado the premier destination in the country for elk hunting. Why hunt elk anywhere else? Colorado offers a vast array of public lands for big game hunting. These lands include Bureau of Land Management areas, national forests, state parks and wildlife areas, and state trust lands. Colorado is home to more than 23 million acres of public land. The incredible amount of public land makes Colorado an ideal place for a big game hunt. Colorado is home to a variety of wild game, both big and small. Big game hunters in Colorado may pursue elk, black bear, mule deer, white-tail deer, pronghorn, bighorn sheep, and mountain goats. The incredible variety of game in Colorado means that hunters have the opportunity to pursue the game of their choice. You owe it to yourself to plan your big game hunt in Colorado where you will be afforded unparalleled opportunity to pursue the animal of your choice. Samuelson Outfitters is a family business that has extensive experience guiding successful hunts in Colorado. One of the best indicators of the quality of an outfitter is whether hunters return again for another hunt. At Samuelson Outfitters, we have many hunters who return year after year for another big game hunt. We guide hunts in the Troublesome Basin which is one of the best elk hunting areas in Colorado. Contact us today at 970-726-8221 to learn more or to book your big game hunt.